The Duke of lllyria, Orsìno, is infatuated with the countess Olivia. However she shows no interest, seeming to mourn endlessly for her father and brother. A shipwreck has left Viola stranded on the lllyrian shore, convinced that her twin brother Sebastian has perished at sea. She asks the seacaptaìn who rescued her to disguise her as a man so she can serve at Orsino’s court. Orsìno takes a shine to Viola’s alterego Cesario and sends “him” to woo Olivia on his behalf. Viola, however, is beginning to fall in love with Orsino. Meanwhile Viola’s brother Sebastian has been rescued by another seacaptain Antonio. He believes his sister to be dead, and heads to Orsino’s court to seek his fortune. Antonio is Orsino’s sworn enemy, and yet finds himself immediately devoted and loyal to his new friend, and resolves to brave all danger and follow Sebastian to protect him from any harm. Back at Olivia’s house, Sir Toby and Sir Andrew’s late night drinking party is interrupted by Malvoiio complaining about the noise. They are so angry at his attitude that they decide to hatch a plot. Maria writes a letter in Olivia’s handwriting to convince him that she is in love with him. He swallows the bait, and eventually presents himself to woo Olivia dressed in cross-garterecl yellow stockings. She assumes that he has lost his wits, and leaves him to the tender care of Sir Toby and company. ln the meantime, Sir Andrew is so jealous of Cesario’s favour with Olivia that he is persuaded by Sir Toby to challenge him to a duel. The fight is about to take place in spite of the combatants’ reluctance, however they are interrupted by the arrival of Antonio, who jumps immediately to Viola’s defence, believing her to be Sebastian. This attracts the attention of Orsino’s officers, who arrest Antonio. He is dismayed when the person he believes to be his friend Sebastian denies all knowledge of him. After he is taken away, Viola realises that he could have mistaken her for her brother, and begins to hope that Sebastian could be alive. The real Sebastian now arrives at the house, pursued by Feste, where he is immediately set upon by Sir Andrew, who believes him to be Cesario (Viola). Sir Andrew gets a shock, therefore, when Sebastian responds with force. This provokes Sir Toby to come to the rescue and set up Sebastian in turn. They are interrupted in the nick of time by Olivia who, discovering Sebastian and believing him to be Cesario, tempts her lover into the house…. Orsìno arrives at the house with Cesario, where he bumps into the arrested Antonio, which revives old enmities. Orsìno cannot understand how Antonio could claim to know his servant Cesario. When Olivia arrives and calls Cesario “husband”, Viola is dismayed, and Orsino thinks he has been betrayed. Sebastian arrives in the nick of time, and all stand amazed at the twins are finally reconciled. Lastly, the plot against Malvolio is discovered, and he is rescued from the dark room, but cannot be placated by his mistress, and exits, swearing his revenge. 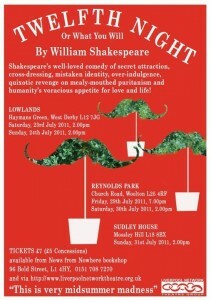 Directed by Andy Kerr and Lauren Steele, Twelfth Night was performed on the 23rd and 24th July 2011, at Lowlands, West Derby; the 29th and 30th July at Reynolds Park, Woolton; and the 31st July at Sudley House, Mossley Hill. It starred Dave Burley, Sean Gaffney, Robert Schofield, Laura Cox, Jonathon Roberts Darren Jones, Geraldine Moloney Judge, Mìke Leane, Demian Stìmson, Faye Christiansen, Frank Kennedy, Emma Whitby, Dave Clayton, Stewart McDonald, Joel Ross and Colin Rice.